For your bachelor’s degree, you may choose from 10 majors offered from six departments. No matter the major, you’ll gain hands-on experience and valuable access to research opportunities in your field that will set you apart from the competition. Our students also work with corporate partners on their senior design capstone projects, applying their knowledge in professional settings and working with leaders in their intended careers. The College of Engineering at UNT offers a unique undergraduate program in Biomedical Engineering that allows a student of the program to major in Biomedical Engineering, minor in mathematics and in an additional area of engineering. Thus, a student graduating from the 120 SCH program will be well rounded and have the engineering skills and expertise to work in industry, hospitals, research institutions or become a motivated entrepreneur. The Bachelor of Science degree with a major in computer engineering is designed for students who wish to specialize in computer hardware, communication systems, digital signal processing, micro-controllers, real-time and embedded systems. The program provides a strong engineering background, with an understanding of the principles and techniques of computing. The Bachelor of Science degree with a major in computer science is a professional degree designed to prepare the student for a computer software development career or further studies in the technology and application of computers. The Bachelor of Science degree with a major in electrical engineering is an innovative undergraduate program designed to combine the best practices in electrical engineering education. This design- and project-oriented program integrates concepts, analysis, design and development of state-of-the-art electrical and electronic systems. The Bachelor of Science degree with a major in materials science and engineering is designed to provide students with the fundamental principles of how materials are made, how they behave during application, how their structure and properties are measured and quantified, and how to improve the performance of these materials. The Bachelor of Science degree with a major in mechanical and energy engineering combines the fundamentals of mechanical engineering with a broad specialization on subjects related to energy production, management, and distribution. The construction engineering technology major provides educational experiences for the development of technical knowledge and skills necessary in today’s construction industry. The program provides education in both the management and technical aspects, thus providing optimum opportunities for employment. The electrical engineering technology major is designed to develop the technical and personal knowledge and skill necessary to compete successfully in today’s electrical industries. The program builds on a strong foundation in mathematics and science and includes courses in network analysis, linear electronics, digital electronics, communication systems and control systems. The mechanical engineering technology major is built upon a strong foundation of science, mathematics and technical course work designed to meet the diverse needs of the mechanical engineer. 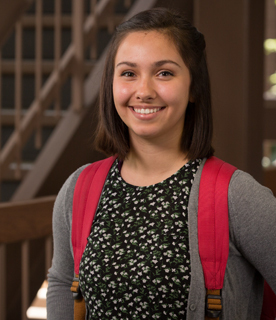 "Having our own campus at Discovery Park reinforces a sense of community in the college. The professors care a lot about you and want you to be comfortable asking for their help."